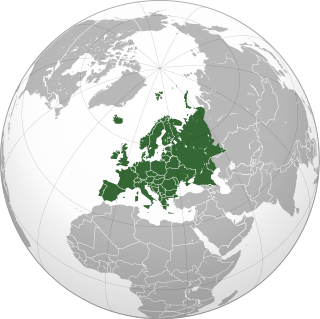 The Kingdom of Scotland (Scottish Gaelic : Rìoghachd na h-Alba; Scots : Kinrick o Scotland) was a sovereign state in northwest Europe traditionally said to have been founded in 843. Its territories expanded and shrank, but it came to occupy the northern third of the island of Great Britain, sharing a land border to the south with the Kingdom of England. It suffered many invasions by the English, but under Robert I it fought a successful War of Independence and remained an independent state throughout the late Middle Ages. 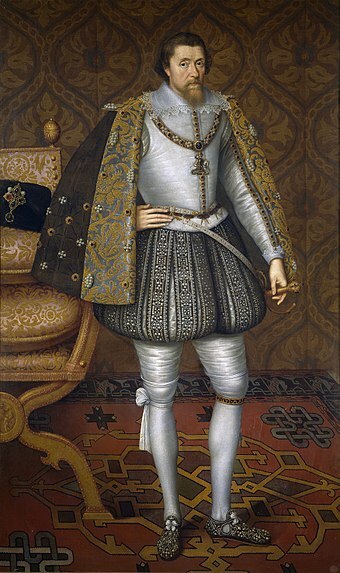 In 1603, James VI of Scotland became King of England, joining Scotland with England in a personal union. In 1707, the two kingdoms were united to form the Kingdom of Great Britain under the terms of the Acts of Union. 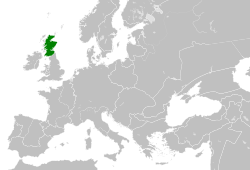 Following the annexation of the Northern Isles from the Kingdom of Norway in 1472 and final capture of the Royal Burgh of Berwick by the Kingdom of England in 1482, the territory of the Kingdom of Scotland corresponded to that of modern-day Scotland, bounded by the North Sea to the east, the Atlantic Ocean to the north and west, and the North Channel and Irish Sea to the southwest. Scots is the Germanic language variety spoken in Lowland Scotland and parts of Ulster in Ireland. It is sometimes called Lowland Scots to distinguish it from Scottish Gaelic, the Celtic language which was historically restricted to most of the Highlands, the Hebrides and Galloway after the 16th century. The Scots language developed during the Middle English period as a distinct entity. 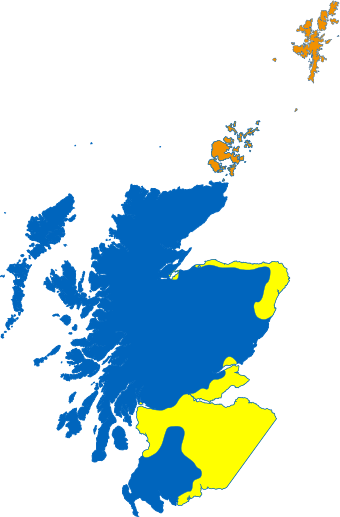 In early medieval Scotland, a mormaer was the Gaelic name for a regional or provincial ruler, theoretically second only to the King of Scots, and the senior of a Taoiseach (chieftain). Mormaers were equivalent to English earls or Continental counts, and the term is often translated into English as 'earl'. Scots law is the legal system of Scotland. It is a hybrid or mixed legal system containing civil law and common law elements, that traces its roots to a number of different historical sources. Together with English law and Northern Irish law, it is one of the three legal systems of the United Kingdom. The Court of Session is the supreme civil court of Scotland and constitutes part of the College of Justice; the supreme criminal court of Scotland is the High Court of Justiciary. The Court of Session sits in Parliament House in Edinburgh and is both a trial court and a court of appeal. Decisions of the Court can be appealed to the Supreme Court of the United Kingdom, with the permission of either the Inner House or the Supreme Court. The Court of Session and the local sheriff courts of Scotland have concurrent jurisdiction for all cases with a monetary value in excess of £100,000; the pursuer is given first choice of court. However, the majority of complex, important, or high value cases are brought in the Court of Session. Cases can be remitted to the Court of Session from the sheriff courts, including the Sheriff Personal Injury Court, at the request of the presiding sheriff. Legal aid, administered by the Scottish Legal Aid Board, is available to persons with little disposable income for cases in the Court of Session. The College of Justice includes the Supreme Courts of Scotland, and its associated bodies. 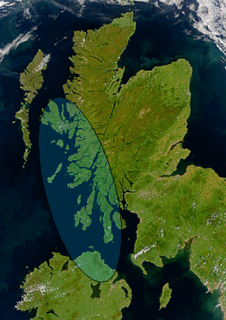 Geographically, Scotland is divided between the Highlands and Islands and the Lowlands. The Highlands had a relatively short growing season, which was further shortened during the Little Ice Age. From Scotland's foundation to the inception of the Black Death, the population had grown to a million; following the plague, it then fell to half a million. It expanded in the first half of the 16th century, reaching roughly 1.2 million by the 1690s. 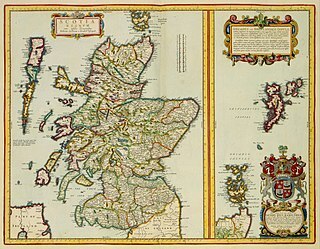 Significant languages in the medieval kingdom included Gaelic, Old English, Norse and French; but by the early modern era Middle Scots had begun to dominate. Christianity was introduced into Scotland from the 6th century. In the Norman period the Scottish church underwent a series of changes that led to new monastic orders and organisation. During the 16th century, Scotland underwent a Protestant Reformation that created a predominately Calvinist national kirk. There were a series of religious controversies that resulted in divisions and persecutions. The Scottish Crown developed naval forces at various points in its history, but often relied on privateers and fought a guerre de course . Land forces centred around the large common army, but adopted European innovations from the 16th century; and many Scots took service as mercenaries and as soldiers for the English Crown. The Highlands and Islands of Scotland are broadly the Scottish Highlands, plus Orkney, Shetland and the Western Isles. The Lowlands are a cultural and historic region of Scotland. 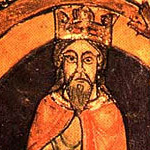 Máel Coluim mac Domnaill was king of Alba, becoming king when his cousin Constantine II abdicated to become a monk. He was the son of Donald II. 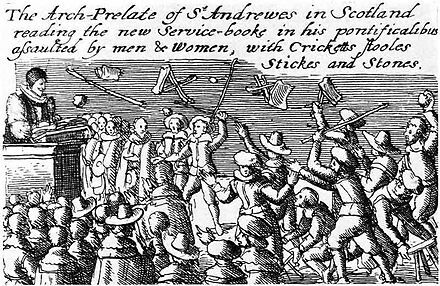 When James' son Charles I attempted to impose elements of the English religious settlement on Scotland, the result was the Bishops' Wars (1637–40), which ended in defeat for the king and a virtually independent Presbyterian Covenanter state in Scotland. It also helped precipitate the Wars of the Three Kingdoms, during which the Scots carried out major military interventions. The introduction of feudalism in the reign of David I of Scotland would have a profound impact on the development of Scottish law, establishing feudal land tenure over many parts of the south and east that eventually spread northward. Sheriffs, originally appointed by the King as royal administrators and tax collectors, developed legal functions. 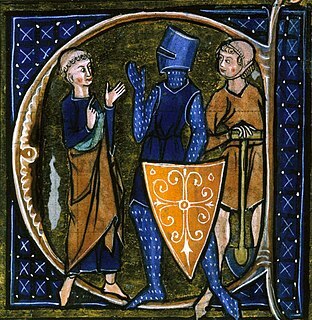 Feudal lords also held courts to adjudicate disputes between their tenants. The recorded history of Scotland begins with the arrival of the Roman Empire in the 1st century, when the province of Britannia reached as far north as the Antonine Wall. North of this was Caledonia, inhabited by the Picti, whose uprisings forced Rome's legions back to Hadrian's Wall. As Rome finally withdrew from Britain, Gaelic raiders called the Scoti began colonising Western Scotland and Wales. Prior to Roman times, prehistoric Scotland entered the Neolithic Era about 4000 BC, the Bronze Age about 2000 BC, and the Iron Age around 700 BC. The history of Christianity in Scotland includes all aspects of the Christianity in the region that is now Scotland from its introduction to the present day. Christianity was "probably" (unlikely) introduced to what is now southern Scotland during the Roman occupation of Britain. It was mainly spread by missionaries from Ireland from the fifth century and is associated with St Ninian, St Kentigern and St Columba. The Christianity that developed in Ireland and Scotland differed from that led by Rome, particularly over the method of calculating Easter and the form of tonsure until the Celtic church accepted Roman practices in the mid-seventh century. 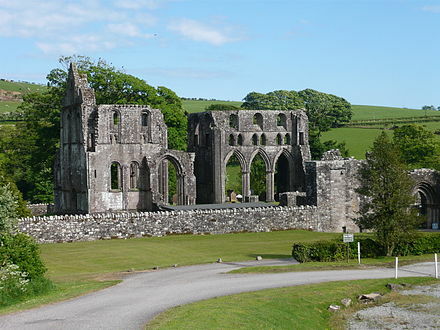 Christianity in Scotland was strongly influenced by monasticism, with abbots being more significant than bishops. In the Norman period, there were a series of reforms resulting in a clearer parochial structure based around local churches and large numbers of new monastic foundations, which followed continental forms of reformed monasticism, began to predominate. The Scottish church also established its independence from England, developing a clear diocesan structure and becoming a "special daughter of the see of Rome", but continued to lack Scottish leadership in the form of Archbishops. 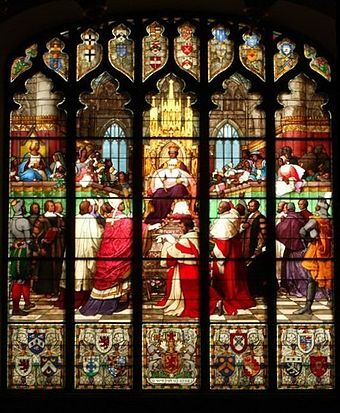 In the late Middle Ages the crown was able to gain greater influence over senior appointments and two archbishoprics had been established by the end of the fifteenth century. There was a decline in traditional monastic life, but the mendicant orders of friars grew, particularly in the expanding burghs. New saints and cults of devotion also proliferated. Despite problems over the number and quality of clergy after the Black Death in the fourteenth century, and evidence of heresy in the fifteenth century, the Church in Scotland remained stable. Scotland in the early modern period refers, for the purposes of this article, to Scotland between the death of James IV in 1513 and the end of the Jacobite risings in the mid-eighteenth century. It roughly corresponds to the early modern period in Europe, beginning with the Renaissance and Reformation and ending with the start of the Enlightenment and Industrial Revolution. Scottish society in the Middle Ages is the social organisation of what is now Scotland between the departure of the Romans from Britain in the fifth century and the establishment of the Renaissance in the early sixteenth century. Social structure is obscure in the early part of the period, for which there are few documentary sources. Kinship groups probably provided the primary system of organisation and society was probably divided between a small aristocracy, whose rationale was based around warfare, a wider group of freemen, who had the right to bear arms and were represented in law codes, above a relatively large body of slaves, who may have lived beside and become clients of their owners. Scottish society in the early modern era encompasses the social structure and relations that existed in Scotland between the early sixteenth century and the mid-eighteenth century. It roughly corresponds to the early modern era in Europe, beginning with the Renaissance and Reformation and ending with the last Jacobite risings and the beginnings of the industrial revolution. Government in early modern Scotland included all forms of administration, from the crown, through national institutions, to systems of local government and the law, between the early sixteenth century and the mid-eighteenth century. It roughly corresponds to the early modern era in Europe, beginning with the Renaissance and Reformation and ending with the last Jacobite risings and the beginnings of the industrial revolution. Monarchs of this period were the Stuarts: James IV, James V, Mary Queen of Scots, James VI, Charles I, Charles II, James VII, William III and Mary II, Anne, and the Hanoverians: George I and George II. Music in early modern Scotland includes all forms of musical production in Scotland between the early sixteenth century and the mid-eighteenth century. In this period the court followed the European trend for instrumental accompaniment and playing. Scottish monarchs of the sixteenth century were patrons of religious and secular music, and some were accomplished musicians. In the sixteenth century the playing of a musical instrument and singing became an expected accomplishment of noble men and women. The departure of James VI to rule in London at the Union of Crowns in 1603, meant that the Chapel Royal, Stirling Castle largely fell into disrepair and the major source of patronage was removed from the country. 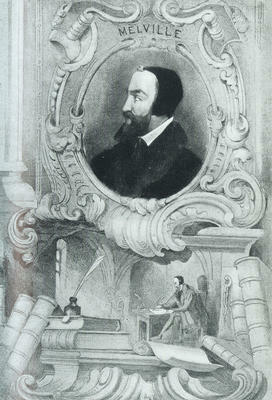 Important composers of the early sixteenth century included Robert Carver and David Peebles. The Lutheranism of the early Reformation was sympathetic to the incorporation of Catholic musical traditions and vernacular songs into worship, exemplified by The Gude and Godlie Ballatis (1567). However, the Calvinism that came to dominate Scottish Protestantism led to the closure of song schools, disbanding of choirs, removal of organs and the destruction of music books and manuscripts. 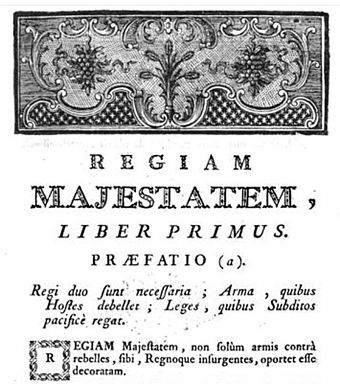 An emphasis was placed on the Psalms, resulting in the production of a series of Psalters and the creation of a tradition of unaccompanied singing. Scottish religion in the seventeenth century includes all forms of religious organisation and belief in the Kingdom of Scotland in the seventeenth century. 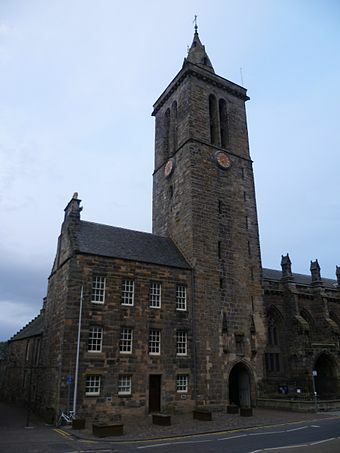 The 16th century Reformation created a Church of Scotland or kirk predominantly Calvinist in doctrine and Presbyterian in structure, to which James VI added a layer of bishops in 1584. The geography of Scotland in the early modern era covers all aspects of the land in Scotland, including physical and human, between the sixteenth century and the beginnings of the Agricultural Revolution and industrialisation in the eighteenth century. The defining factor in the geography of Scotland is the distinction between the Highlands and Islands in the north and west and the Lowlands in the south and east. The Highlands were subdivided by the Great Glen and the Lowlands into the fertile Central Lowlands and the Southern Uplands. 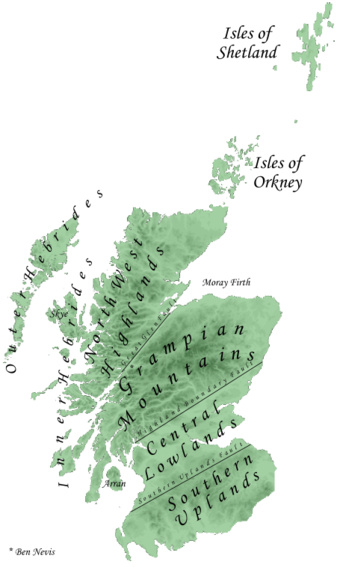 The Uplands and Highlands had a relatively short growing season, exacerbated by the Little Ice Age, which peaked towards the end of the seventeenth century. Literature in early modern Scotland is literature written in Scotland or by Scottish writers between the Renaissance in the early sixteenth century and the beginnings of the Enlightenment and Industrial Revolution in mid-eighteenth century. 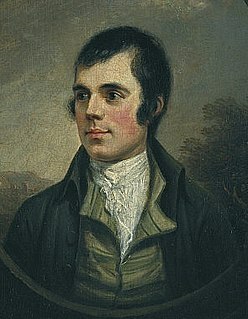 By the beginning of this era Gaelic had been in geographical decline for three centuries and had begun to be a second class language, confined to the Highlands and Islands, but the tradition of Classic Gaelic Poetry survived. Middle Scots became the language of both the nobility and the majority population. 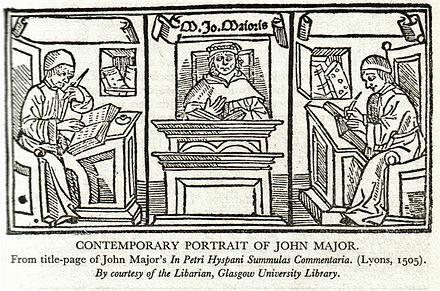 The establishment of a printing press in 1507 made it easier to disseminate Scottish literature and was probably aimed at bolstering Scottish national identity. Scottish trade in the early modern era includes all forms of economic exchange within Scotland and between the country and locations outwith its boundaries, between the early sixteenth century and the mid-eighteenth. The period roughly corresponds to the early modern era, beginning with the Renaissance and Reformation and ending with the last Jacobite risings and the beginnings of the Industrial Revolution. The Royal Court of Scotland was the administrative, political and artistic centre of the Kingdom of Scotland. It emerged in the tenth century and continued until it ceased to function when James VI inherited the throne of England in 1603. For most of the medieval era, the king had no "capital" as such. The Pictish centre of Forteviot was the chief royal seat of the early Gaelic Kingdom of Alba that became the Kingdom of Scotland. In the twelfth and thirteenth centuries Scone was a centre for royal business. Edinburgh only began to emerge as the capital in the reign of James III but his successors undertook occasional royal progress to a part of the kingdom. Little is known about the structure of the Scottish royal court in the period before the reign of David I when it began to take on a distinctly feudal character, with the major offices of the Steward, Chamberlain, Constable, Marischal and Lord Chancellor. By the early modern era the court consisted of leading nobles, office holders, ambassadors and supplicants who surrounded the king or queen. The Chancellor was now effectively the first minister of the kingdom and from the mid-sixteenth century he was the leading figure of the Privy Council. ↑ Sharpe, R (2011). "Peoples and Languages in Eleventh- and Twelfth-century Britain and Ireland: Reading the Charter Evidence" (PDF). In Broun, D. The Reality Behind Charter Diplomatic in Anglo-Norman Britain (PDF). Glasgow: Centre for Scottish and Celtic Studies, University of Glasgow. pp. 1–119. ISBN 978-0-85261-919-3 – via Paradox of Medieval Scotland 1093–1286. 1 2 A. Macquarrie, Medieval Scotland: Kinship and Nation (Thrupp: Sutton, 2004), ISBN 0-7509-2977-4, p. 153. 1 2 P. J. Bawcutt and J. H. Williams, A Companion to Medieval Scottish Poetry (Woodbridge: Brewer, 2006), ISBN 1843840960, p. 21. 1 2 Mackie, Lenman and Parker, A History of Scotland, pp. 241–45. 1 2 McNeill and MacQueen,Atlas of Scottish History to 1707, pp. 191–4. 1 2 G. W. S. Barrow, The Kingdom of the Scots (Edinburgh: Edinburgh University Press, 2003), pp. 69–82. ↑ Davies, Rees (1984). 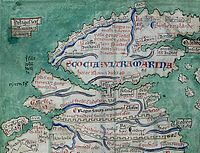 "Law and national identity in thirteenth century Wales". In R. R. Davies; R. A. Griffiths; I. G. Jones; K. O. Morgan. Welsh Society and Nationhood. Cardiff: University of Wales Press. pp. 51–69. ISBN 978-0-7083-0890-5. 1 2 3 4 J. Cannon, The Oxford Companion to British History (Oxford: Oxford University Press, 1997), ISBN 0198605145, p. 225. 1 2 J. Chown, A History of Money: From AD 800 (London: Routledge, 1996), ISBN 0415102790, p. 24. 1 2 G. Donaldson and R. S. Morpeth, A Dictionary of Scottish History (Edinburgh, 1999), p. 43. 1 2 3 C. Harvie, Scotland: a Short History (Oxford: Oxford University Press, 2002), ISBN 0192100548, pp. 10–11. 1 2 3 Wormald, Court, Kirk, and Community, pp. 60–7. 1 2 Wormald, Court, Kirk, and Community, pp. 76–87. 1 2 3 4 5 Bawcutt and Williams, A Companion to Medieval Scottish Poetry, pp. 29–30. 1 2 3 Lynch, Scotland: A New History, pp. 104–7. 1 2 Wormald, Court, Kirk, and Community, pp. 68–72. 1 2 3 4 Webster, Medieval Scotland, pp. 124–5. ↑ "School education prior to 1873", Scottish Archive Network, 2010, archived from the original on 2 July 2011 . 1 2 R. Anderson, "The history of Scottish Education pre-1980", in T. G. K. Bryce and W. M. Humes, eds, Scottish Education: Post-Devolution (Edinburgh: Edinburgh University Press, 2nd edn., 2003), ISBN 0-7486-1625-X, pp. 219–28. 1 2 Wormald, Court, Kirk, and Community, pp. 183–4. 1 2 P. F. Tytler, History of Scotland, Volume 2 (London: Black, 1829), pp. 309–10. 1 2 3 N. A. M. Rodger, The Safeguard of the Sea: A Naval History of Britain. 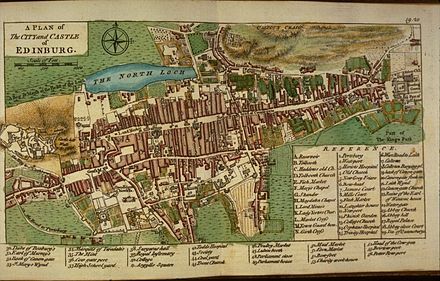 Volume One 660–1649 (London: Harper, 1997) pp. 74–90. 1 2 3 4 J. 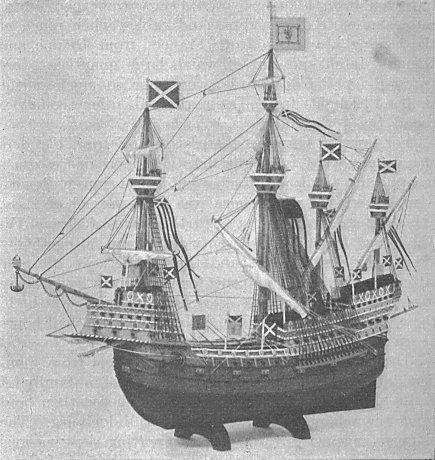 Grant, "The Old Scots Navy from 1689 to 1710", Publications of the Navy Records Society, 44 (London: Navy Records Society, 1913-4), pp. i–xii. 1 2 T. Christopher Smout, Scotland and the Sea (Edinburgh: Rowman and Littlefield, 1992), ISBN 0-85976-338-2, p. 45. 1 2 S. Murdoch, The Terror of the Seas? : Scottish Maritime Warfare, 1513–1713 (Leiden: Brill, 2010), ISBN 90-04-18568-2, pp. 33–4. 1 2 Dawson, Scotland Re-Formed, 1488–1587, p. 76. 1 2 J. S. Wheeler, The Irish and British Wars, 1637–1654: Triumph, Tragedy, and Failure (London: Routledge, 2002), ISBN 0415221315, pp. 19–21. 1 2 E. M. Furgol, "Warfare, weapons and fortifications: 3 1600–1700" in M. Lynch, ed., The Oxford Companion to Scottish History (Oxford: Oxford University Press, 2001), ISBN 0-19-211696-7, pp. 637–8. ↑ Leask, Anthony (2006). Sword of Scotland: Our Fighting Jocks. Pen and Sword Books Limited. p. 85. ISBN 978-1844154050. ↑ "United Kingdom Monarchs (1603–present)". The Royal Household. Archived from the original on 10 March 2010. Retrieved 2009-12-15. ↑ "Royal Standard". The Royal Household. Archived from the original on 28 December 2009. Retrieved 2009-12-15. ↑ "'Super regiment' badge under fire". BBC News. British Broadcasting Corporation. 2005-08-16. Retrieved 2009-12-09. 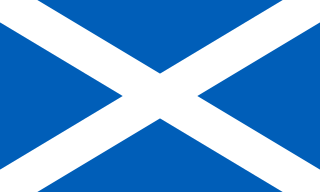 1 2 "Feature: Saint Andrew seals Scotland's independence". The National Archives of Scotland. 2007-11-28. Archived from the original on 16 September 2013. Retrieved 2009-12-09. ↑ National Library of Scotland "Plate from the Lindsay Armorial" Check |url= value (help). Scran. Royal Commission on the Ancient and Historical Monuments of Scotland. 1542. Retrieved 2009-12-09. ↑ Fox-Davies, Arthur Charles (1904) . The Art of Heraldry: An Encyclopædia of Armory. London: Bloomsbury Books. 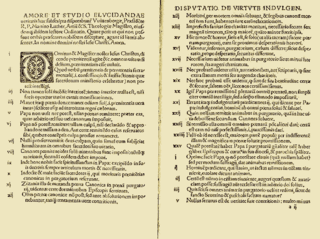 p. 399. ISBN 978-0-906223-34-5.